Blade length is 33", and overall 39"
A.Scottish Sword W/brass basket-The basket hilt sword developed alongside the rapier, and was often dubbed as a broadsword in comparison. 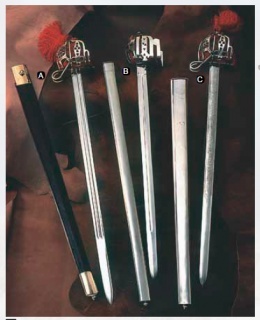 This unique styled-sword is characterized by a basket-shaped guard that protects the hand. The basket hilt was developed by the quillons around the Late Middle Ages. This was known as a military sword and used by heavy calvary during the Napoleonic Era. The double fullered blade is hand forge EN45 carbon steel. Overall length 42" and includes scabbard decorated with brass tips. B.Double Edged Culloden Basket Sword - Dating back to the 18th Century, this sword was used by heavy cavalry during the Napoleonic Era. It features a leather covered wooden grip, and it's elegantly bundled with twisted wire. The basket and pommel are constructed of nickel plated solid steel. Blade length is 33", and overall 39". This page was last modified on 25 July 2014, at 18:46.